The 1941 Goudey baseball card set is the last Goudey card set that was ever released. Goudey had made some of the best gum cards in its eight years of operation, so this set was somewhat of a disappointment. The set itself appears to be small at first glance, as it includes only 33 total players. However, there are four possible solid background colors for each card. The cards can come in blue, red, green, or yellow. According to PSA, the red background is the most difficult to find, while the other three colors are all equally abundant. 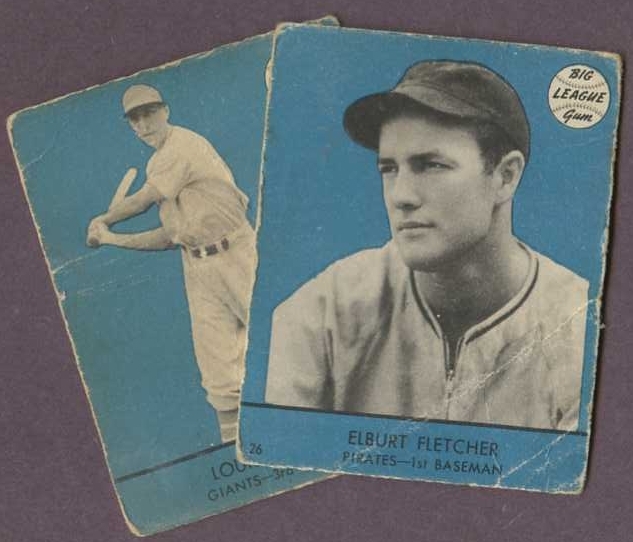 The 1941 Goudey set, or R324 set, is not popular with collectors for several reasons. It can be very difficult to build a master set with all four colors, but once the set is built, there are only two stars (Mel Ott and Carl Hubbell). These cards are also the only Goudey issue to have blank cardboard backs. Finally, many of the cards have rough edges or are badly miscut. This type of card would go out of style, leading the Play Ball cards, which featured much nicer photographs and backs. However, these cards represent the end of the Goudey era, which gave collectors many wonderful sets to enjoy. Please click here if you are interested in viewing our inventory of 1941 Goudey cards. Please click here to see our selection of 1941 Goudey reprint cards.